For more than a decade, this elderly monkey knew nothing other than the rusted wire walls of his tiny, slanted cage. Earlier this week, members of the Laos Wildlife Rescue Center (LWRC) received a call from a woman who said she was keeping a stump-tailed macaque in a cage behind her home. "[We] went to see what they could do for this poor animal that was in crucial need of rescue," LWRC wrote in a Facebook update. What they found was worse than expected. 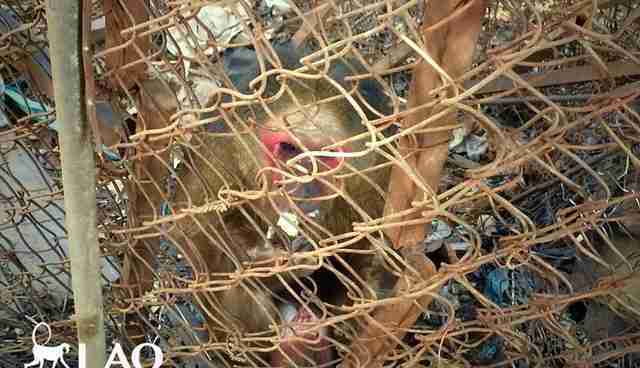 The aged monkey was living in a tiny dilapidated structure built of old metal poles and pieces of mesh. The cage was just a few feet across, leaving the macaque with barely enough room to move. The floor was littered with trash. He had no toys and no source of comfort. Even worse, he had been living there for 13 long years. Fortunately, after so many years of locking him up, the woman readily agreed to turn the monkey - now known as Arnold - over to LWRC. The rescue team jumped into action, sedating him and removing him - at long last - from the ramshackle prison. Photos of the grizzled monkey show that the years appear to have taken their toll on him. While Arnold's years-long fate was a sad one, he's not alone. 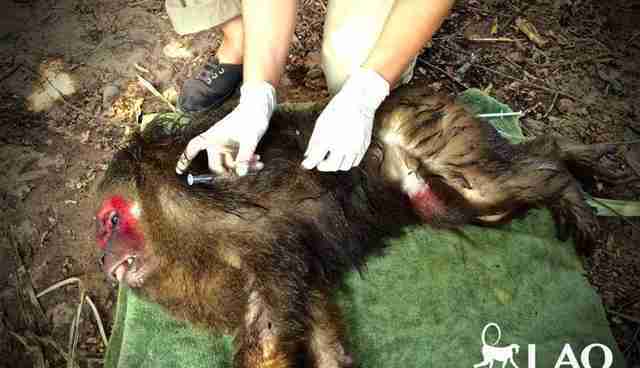 The illegal wildlife trade is thriving in Laos and other parts of Asia, with thousands of monkeys, apes, bears and other wild animals sold into the pet trade or for use in traditional medicine. Many of them are captured from the wild as babies after their mothers are killed by poachers. Just last week, LWRC rescued a bear named Joe from a similar situation. He was surviving off sweets and candy in a tiny cage and had only trash to play with. Arnold was one of the lucky ones. 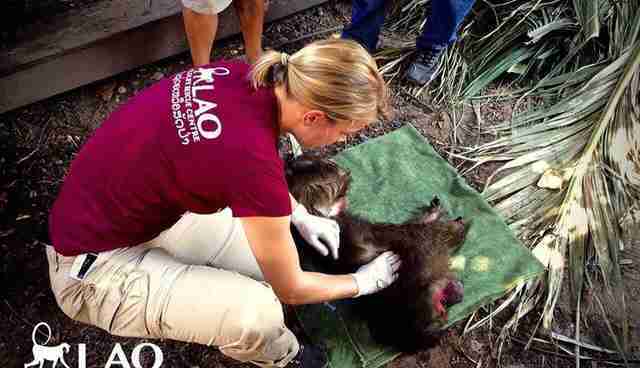 According to LWRC, an NGO that previously ran the Lao Zoo had been trying for years to rescue Arnold, but never succeeded. 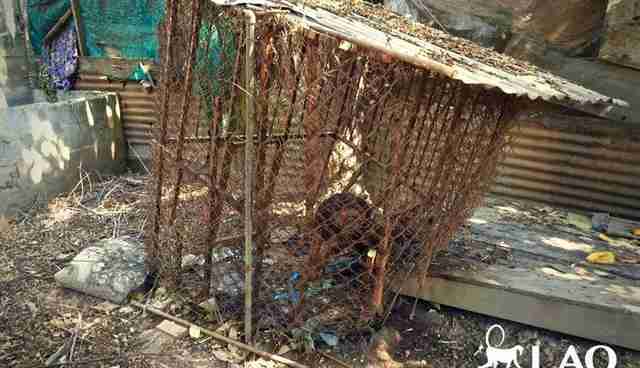 "We are delighted to finally see this macaque out of the hideous 'home' he had been confined to," the group wrote on Facebook. Now, Arnold has been relocated to LWRC's sanctuary. While it's unlikely that he'll ever be able to return to the wild, LWRC hopes to give him the next best thing after he's out of quarantine. "We hope in the future to integrate Arnold into one of our macaque groups and provided him with ample space to live in one of our yet to be completed open macaque fields," the group wrote. If you'd like to support Arnold and other rescued animals like him, you can make a donation to LWRC through their sister group, Wildlife Friends Foundation Thailand.